Just how small is a “Ultra-Micro” rc airplane? Here’s a comparison of a more common sized airplane with a 31.5 inch wing span. In this review I will be reviewing the ParkZone P-51D Ultra-Micro Mustang by ParkZone. I’ll be covering everything that I feel is important so you can make the right decision! From showing you the controls in flight to listing important tips to make the plane fly smoothly. 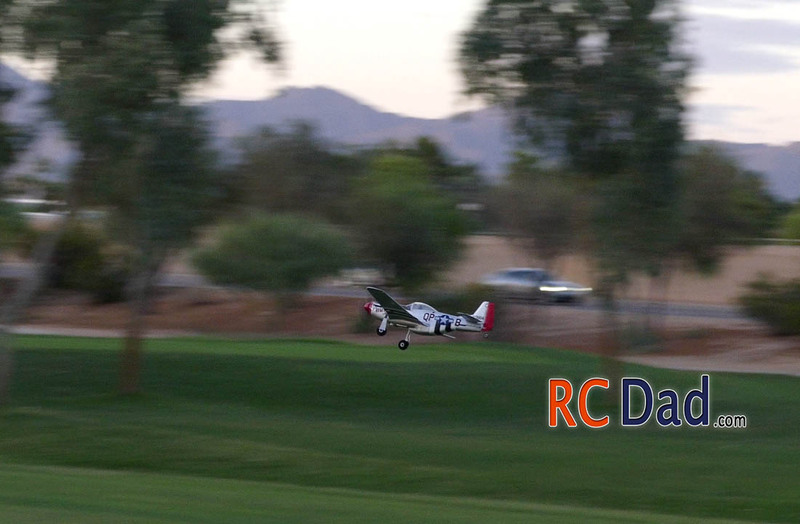 If you’re a beginner pilot, you will want to learn on something else like the Sport Cub S2 which I reviewed here http://rcdad.com/sport-cub-s2-beginners-rc-airplane/ . This plane is unforgiving in stalls and need to be flown pretty fast to keep it airborne. 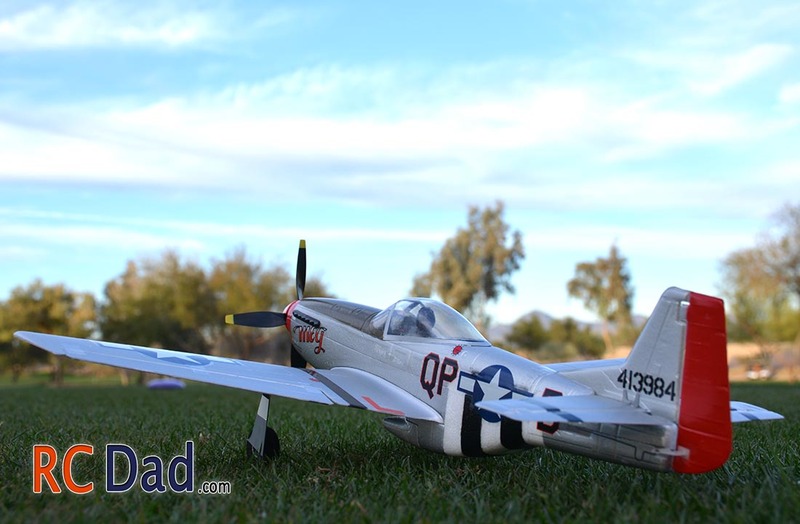 Even with some 4-channel experience I still manage to crash and land pretty hard and the P51D held up very well. The great thing about micro planes is that they don’t break as easily as larger/heavier airplanes. I was really surprised with the amount of abuse this plane took while I was learning to fly it. The thing about these micro planes is that they weight so little that when you do crash there’s less damage compared to a similar crash on a larger plane. You do get full 4 channel control! And the tiny servos are smooth and very proportional which you wouldn’t expect with such a small plane. 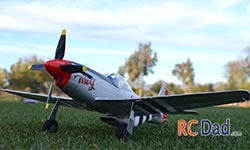 Here’s a more common sized rc airplane, this P51 has a 31 inch wingspan. 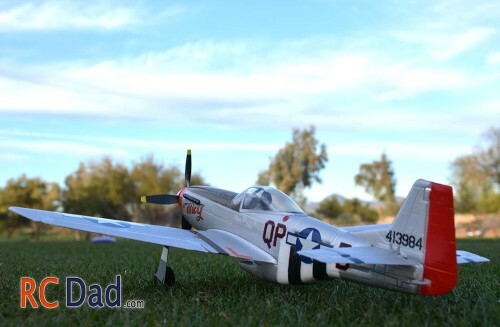 The ParkZone P51 only has only a 18” wing span and is 14” long. 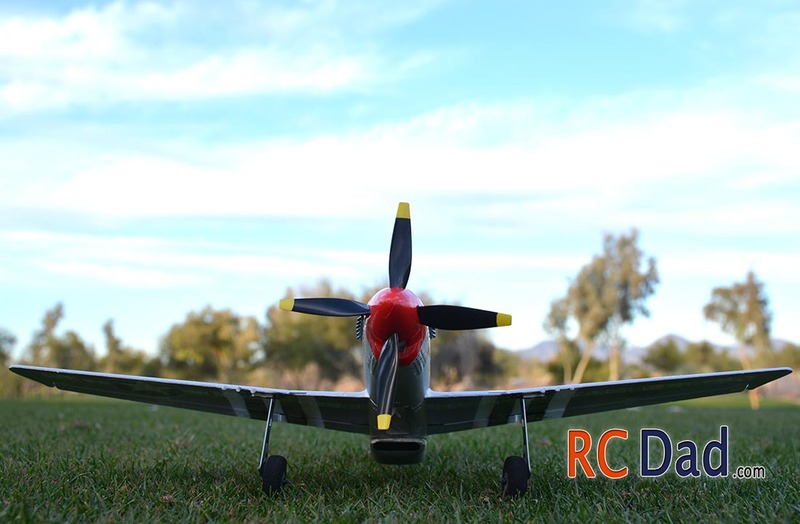 All your servos that control surfaces are built into the plane which really adds an amazing scale appearance to this plane. I love the way this thing looks in the air! There are two versions, a “ready to fly” and a “bind and fly”. 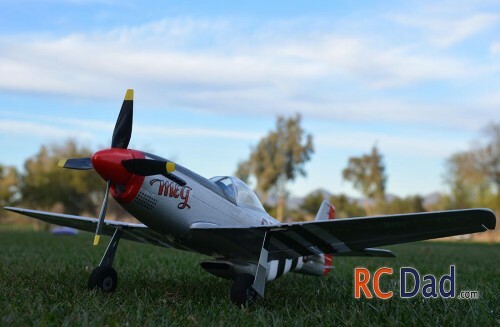 The ready to fly comes with a transmitter that will get you by, but the problem I have with it, is that it would randomly loose signal for a split second. If you’re flying a glider high up, that’s no big deal, but with the P51 Mustang a second of signal loss is all that it takes to run it into the ground. To maintain solid control, the Mustang doesn’t like to fly slow and has to be flown with at least 40-50% power. It’s so light in relation to its high drag so when you cut the power this thing glides like an ostrich. This is why I highly recommend a Spektrum DX6i Transmitter. The signal is very reliable and you can easily bind it with any BNF “Bind and fly” airplane. You can easily hand launch it, the great thing about the mustangs is their large air scoop which makes hand launching really easy. 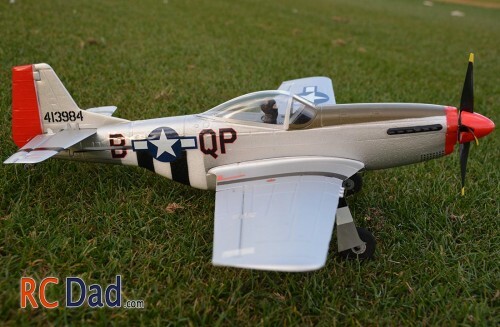 Or you can take off from a hard surface or if you have very short grass, you can take off from and land in the grass. Landing is grass will take full tail up rudder right at touch down to keep the plane from nosing over. 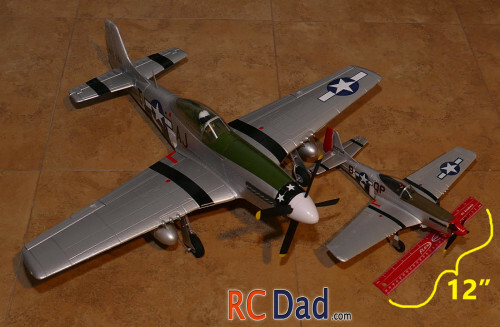 The rudder does control the tail wheel and you would turn the same way you would with any other tail wheel war bird. The under-cambered wing is very efficient and creates a good amount of lift, but it struggles at flying upside down. The speed is another issue for beginners. Cruising requires at least 50-60% power and turning requires a boost in power to keep it from nosing down. When you’re flying this fast it’s easy for one little mistake to end up in a nasty crash. I’m far from a good pilot, but I do have some experience with the Piper Cub S which I learned to fly a 4-channel airplane on. I included a link to my review on that plane if you want to check it out. If you’ve flown 4 channel planes before you’ll love the responsiveness of this plane. 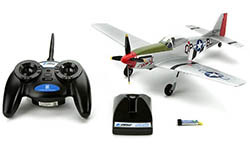 The large control surfaces will allow you to do precise aerobatics in a pretty small area. I don’t live close to a large airfield and that’s why I love these micro planes. These are great for people who have limited space to fly and they don’t take up a lot of space in your house! A lot of these will actually store nicely in the box they ship in which is super convenient when moving or storing them. There’s an air vent on the nose which helps cool down your electronics but you should still let your motor cool down before swapping out the battery and flying again. The battery is held on with Velcro and I do notice some of my lectron batteries starting to lose their grip so I bring a roll of scotch tape hold them in better. The velcrow on the e-flite batteries seems to last a lot longer. Spare parts are very affordable too! The Fuselage with Canopy run around $15! Tape rear Rudder and glue bottom tab. I noticed mine was lose and I didn’t get full rudder movement until I reinforced it. Keep the box! 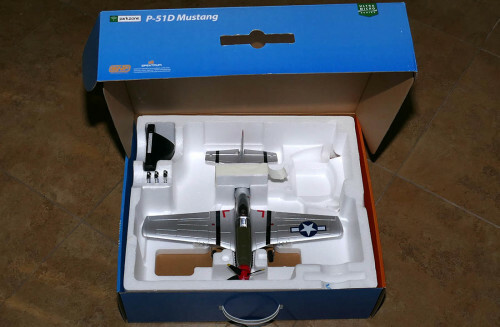 The box the came with the airplane is perfect for storing and traveling. It even comes with slots for extra batteries. Thanks for the review! I got the buf version with the dx6i and it fliews GR8! When are you going to post the t28 review? 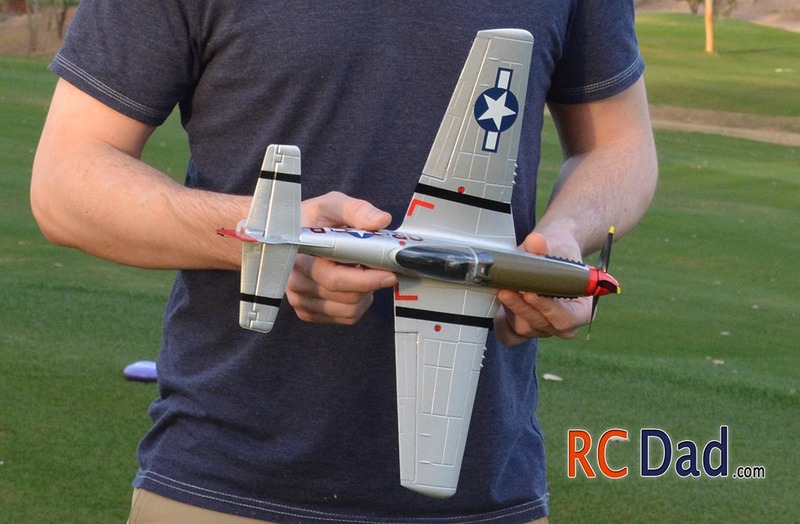 I got the rtf version of the umx p51. Just like you said it cut out a lot. 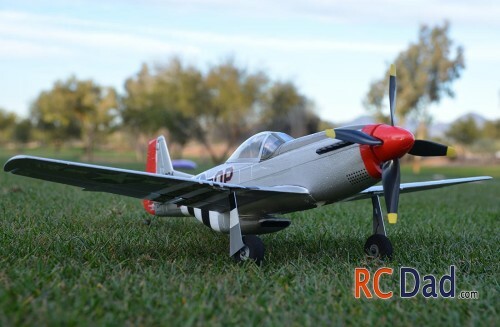 So i was wondering if a rtf p51 could be bound to a dx61. Yes it can! 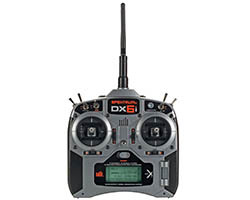 You’ll notice a improvement in handling with the DX6i compared to the transmitter that comes with the RTF version.